Douglas was instrumental in the formulation of the bills which constituted that section of the Compromise of 1850 that allowed the residents of Utah and New Mexico to decide whether or not their states would institute slavery. This freedom of choice became known as the policy of Popular Sovereignty. Four years later, Douglas again attempted to apply this policy to the slavery issue involved in the admission of Kansas and Nebraska to the Union. The plan was not successful, however, for the proslavery and antislavery forces in Kansas clashed in a violent action. Two separate governments were established, the Lecompton, or proslavery, faction and the abolitionist faction. 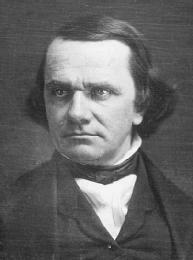 Douglas vehemently opposed the Lecompton Constitution, and criticized President James Buchanan's support of such a measure. After much violence and debate, Kansas was admitted as a free state. Abraham Lincoln and Douglas were opponents in the Illinois senatorial election of 1858, and they met seven times throughout their campaign to debate the issues. These arguments were the famous Lincoln-Douglas debates, and several of Douglas's responses won him disfavor with southern Democrats. Although he won the senatorial election, this faction was responsible for Douglas's removal from the Committee on Territories.